(Newcastle, Nevis) – A Fountain man was killed and another driver injured after their vehicles collided Monday morning just north of the Vance Amory International Airport. According to witnesses at the crash site, and people who arrived at the accident scene immediately after it happened extricated the man who later died from his vehicle, then dispatched him and the other victim to the hospital before authorities arrived. According to the Royal St. Kitts-Nevis Police Force, the accident occurred Feb. 11 about 10:30 a.m. on the road at Newcastle between Shaws Road and Rumors Bar. A bus, driven by Adolphus “Perry” Liburd, 32, collided head-on with a motor pickup driven by Michale Brookes of Prospect, according to police reports. The vehicles were traveling in opposite directions. The pickup was headed toward Charleston and the bus was traveling toward Bricklin at the time of the wreck. Witnesses at the scene said the bus driven by Mr. Liburd hit the oncoming pickup, spun and became lodged under the rear platform of the truck. The group that reached at the site was trying to move the bus from under the pickup when a privately-owned crane truck drove by. The crane truck lifted the rear of the pickup off the truck and the volunteers began removing the bus door with hammers and cold chisels. According to employees of the Woodstock Construction Company who were there, about 20 people worked to get Mr. Liburd out of the truck. With no emergency personnel at the scene, Mr. Brookes and Mr. Parry were taken by private vehicles to Alexandra Hospital, where Mr. Liburd died. Mr. Brookes sustained a broken right leg and arm. No cause was given for the accident. 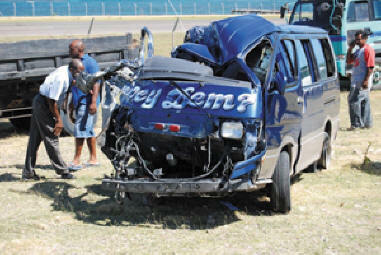 This is the second road fatality in Nevis this year and the third in the Federation.